Chlordiazepoxide Overdose is the accidental or intentional intake of the drug in dosage higher than prescribed values. Chlordiazepoxide Overdose may be also referred to as Librium Overdose. What are the Causes of Chlordiazepoxide Overdose? What are the Signs and Symptoms of Chlordiazepoxide Overdose? The signs and symptoms of Chlordiazepoxide Overdose can vary from one individual to another. It may be mild in some and severe in others. Several systems of the body, such as the respiratory system, nervous system, vascular system, digestive system, skin and ENT may be affected. How is First Aid administered for Chlordiazepoxide Overdose? Who should administer First Aid for Chlordiazepoxide Overdose? 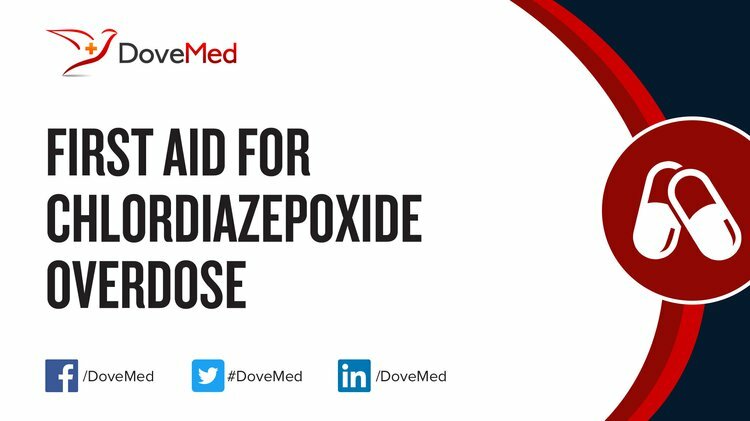 First aid for Chlordiazepoxide Overdose is administered by healthcare professionals. What is the Prognosis of Chlordiazepoxide Overdose? How can Chlordiazepoxide Overdose be Prevented? Mansouripour, S. M., & Afshari, R. (2013). Chlordiazepoxide preventive effect on tramadol overdose induced serotonin syndrome evaluated by Hunter and Radomski criteria: A clinical trial. Toxicology international, 20(2), 126. Taheri, M. S., Noori, M., Nahvi, V., & Moharamzad, Y. (2010). Features of neurotoxicity on brain CT of acutely intoxicated unconscious patients. The open neuroimaging journal, 4, 157. Moh’d Al-Halawani, P. S., Abdeen, Y., Shaaban, H., Klukowicz, A. J., & Miller, R. A. (2015). Continuous intravenous flumazenil infusion in a patient with chlordiazepoxide toxicity and hepatic encephalopathy. Journal of emergencies, trauma, and shock, 8(1), 58. DIEKSTRA, R. (2013). Suicidal behavior and benzodiazepines. Depression and Suicide: Aspects Medicaux, Psychologiques et Socio-Culturels, 473. Renner Jr, J. A., Ross, J. D., & Gastfriend, D. R. (2010). Drug-addicted patients. Massachusetts General Hospital Handbook of General Hospital Psychiatry-E-Book, 163. Al-Halawani, M. (2015). Chlordiazepoxide overdose. Reactions, 1565, 66-22. López-Muñoz, F., Álamo, C., & García-García, P. (2011). The discovery of chlordiazepoxide and the clinical introduction of benzodiazepines: half a century of anxiolytic drugs. Journal of anxiety disorders, 25(4), 554-562. Park, T. W., Saitz, R., Ganoczy, D., Ilgen, M. A., & Bohnert, A. S. (2015). Benzodiazepine prescribing patterns and deaths from drug overdose among US veterans receiving opioid analgesics: case-cohort study. Bmj, 350, h2698.